Biography of Early Renaissance International Gothic Painter. Gentile da Fabriano was an influential, itinerant painter from the Italian Marches practising during the early Renaissance, who promulgated the International Gothic style in Venice, Florence, Rome, and throughout northern and central Italy. The exceptionally high reputation he enjoyed during his lifetime was based on the completion of several important commissions, many of which have disappeared or survive only in a fragmentary state. His impact on Renaissance art derived from such masterpieces of International Gothic style painting as the Adoration of the Magi (1423, Uffizi, Florence) and the Quaratsei Altarpiece (1425, divided between the British Royal Art Collection, Uffizi Gallery, Vatican Museum and National Gallery Washington DC). The decorative beauty of his work had a telling effect on his contemporaries, even though it was later superceded by the more naturalistic work of Masaccio (1401-1428). Today, he is considered to be one of the great Old Masters of the Italian Renaissance whose style bridges the gap between Gothic painting and the new idiom which emerged in Florence during the early 15th century. Gentile da Fabriano was born to a prominent family in Fabriano, but little is known of his arts training and early career. Though influenced by the art of his fellow-townsmen Allegretto Nuzi and Francesco di Cecco Ghissi, he seems to have assimilated the International Gothic style mainly from the miniaturists and painters of Lombardy. Signs of this are evident in what is perhaps his earliest surviving panel painting, the signed Madonna and Child with St Nicholas, St Catherine and Donor (c.1395; Staatliche Museen, Berlin), painted for the church of S.Niccolio in Fabriano. Between 1395 and 1400 Gentile painted the Coronation Altarpiece for the Franciscan convent in Fabriano (now divided between two private collections) and the more advanced Valle Romita Polyptych for the hermits' church of S.Maria di Valdisasso, near Fabriano (now in the Pinacoteca di Brera, Milan). In this signed example of polyptych altarpiece art - long dismantled, but now reassembled in a modern frame - the Lombard International style is tempered by a new softness, as in the features of the Madonna and the undulation of her silk gown. Gentile must have traveled to Venice about 1406 or 1407; there is a record of his presence there in 1408. A 1581 guide to Venice mentions an altarpiece by Gentile in S.Felice, and mural painting by him in the Grand Hall of the Ducal Palace: none of these survive - all of Gentile's Venetian works are now lost. But the fact that he - an immigrant artist - was commissioned to decorate the main hall of the Ducal Palace is proof of his reputation and the outstanding quality of his fine art painting. From 1414 to 1419 Gentile worked at the cosmopolitan court of Brescia in Lombardy, where he painted a chapel for Pandolfo Malatesta (destroyed at the beginning of the 19th century). On its completion, he accepted an invitation to work for Pope Martin V, who was making his way south to Rome. But owing to the Pope's delay, it was another seven years before Gentile entered his service. He might have returned to a career of provincial obscurity in Fabriano, had not his arrival in Florence, in the Pope's footsteps, occurred at an opportune moment: at a time, that is, when the rich Florentine burghers were beginning to ape the tastes of the courts of northern Italy and France. Gentile's religious paintings catered precisely to this taste. 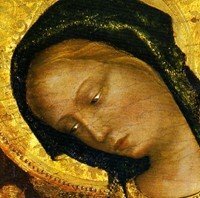 His versions of The Madonna of Humility (examples in the Museo Nazionale, di S.Matteo, Pisa, and Fitzwilliam Museum, Cambridge; both 1420-22) are refined and aristocratic. Fashion predominates over saintliness, as in his Washington Madonna (1422; National Gallery of Art, Washington DC), her tunic sleeve, under a mulberry-red robe, embroidered in gold with a pomegranate pattern. The fashionable International Gothic style Gentile brought to Florence was already known there, but in a diluted, Sienese version. Gentile expressed its full force in the signed and dated altarpiece he painted for the wealthy Florentine businessman Palla Strozzi (1423; Uffizi, Florence). It consists of a single main panel of the Adoration of the Magi; there are lunettes above the three arches at the top of the panel, and a three-panel predella below. An inseparable component is the Gothic frame, of which the polygonal corner posts are painted with miniature panels of Mediterranean flowers. In the main panel, Gentile depicts the Epiphany as a courtly cavalcade. Sumptuously attired in gold-encrusted brocades, the three Kings have dismounted before the Madonna. A veritable menagerie (which may have been painted by Gentile's friend Pisanello) accompanies the entourage that crowds the foreground. In the background, passing through cities and castles on their way, the Magi journey towards Bethlehem: a seemingly endless procession meandering flamboyantly from one side of the panel to the other. The predella panels show an attempt - new in Italian painting - to represent real sky instead of a gold background. Soon after finishing the Strozzi Altarpiece, Gentile began work on another Florentine private commission: the polyptych Quaratesei Altarpiece painted for the Chapel of the Quaratesei family in S.Niccolo sopr'Arno. In his "Lives of the Artists" Giorgio Vasari called this "unquestionably the best of all the works of this artist which I have seen". Consisting of five gabled panels and a predella, the Quaratesei Polyptych was unfortunately dismantled in the early 19th century, its frame (with the date 1425) destroyed, and the panels dispersed throughout various collections. The central panel of the Madonna and Child with Angels is now in London (Hampton Court Palace) and the side panels of saints are in Florence (Uffizi). Once again, the emphasis is on sumptuous accoutrements, as in the Magdalen's ermine-lined mantle and the embroidered stole of St Nicholas. After May 1425 Gentile went to Siena, where he painted a Madonna and Saints (now lost). At the end of the same year, travelling south, he painted a Madonna and Child in fresco in Orvieto Cathedral; although damaged, this gives some impression of his more monumental late style. Arriving in Rome in 1426, Gentile finally entered the service of Pope Martin V, for whom he executed frescoes of St John the Baptist in the Lateran Basilica (1427). These were later destroyed to make way for Borromini's Baroque interior. Gentile's last work in Rome seems to have been a Madonna and Saints in S.Maria Novella described by Vasari but now lost. It was in the adjoining convent that he died in the autumn of 1427. The Lateran frescoes were completed by Pisanello, who has left one or two drawings that relate to them, and who inherited Gentile's belongings. Though nothing appears to have survived of Gentile's work in Rome (apart from a ruined Madonna and Child in Velletri), its importance cannot be minimized. Gentile had a major influence upon contemporary Early Renaissance painting - notably upon Antonio Pisanello (1394-1455), Jacopo Bellini (1400-70), the Sienese artist Giovanni di Paolo (c.1400-82), and (most importantly) the great Fra Angelico (c.1400-55) who was his most important heir. In summary, he was the first great quattrocento artist to work in Rome after the return of the Papacy, and he laid the foundations of Renaissance painting there, as to some extent he had already done in Venice and Florence. Paintings by Gentile da Fabriano can be seen in many of the best art museums throughout the world.  For more biographical details about Renaissance fresco painters, see: Homepage.